"John was prepared and engaged during the interview process and had a strong resume, cover letter and work ethic. Point Park University has nurtured his strengths, providing him opportunities and a well-rounded education with applicable curriculum and supportive faculty and staff." "My SAEM classes have given me insight into what to expect working in the real world. The classes are very hands on and the professors know the industries because they have worked in them." I’ve always had an interest in sports, but I wasn’t sure what I wanted to do coming out of high school. I decided to take my prerequisite courses at Westmoreland County Community College and then I applied to quite a few schools in Pennsylvania, West Virginia and Florida. When I came across Point Park’s website and the sports, arts and entertainment management major, I was really interested, but wasn’t sure if the University was within my budget since it’s a private school. However, I applied and was offered a great transfer scholarship. This cemented in my decision and definitely helped a lot. 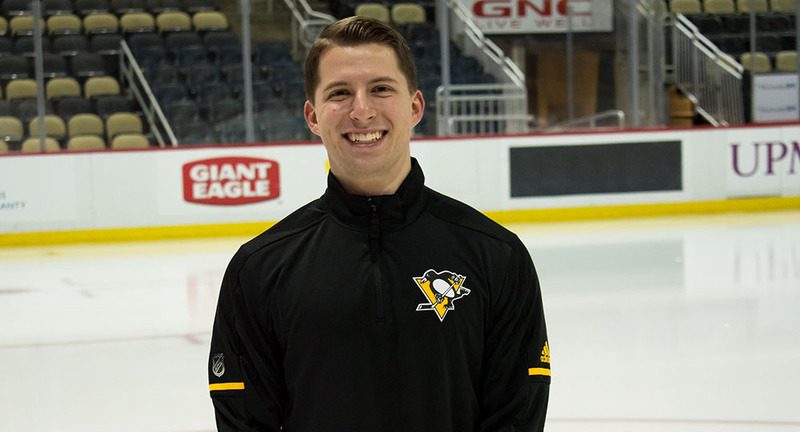 How did you land your current internship with the Pittsburgh Penguins? I attribute this opportunity with the Penguins — and my internship with the Steelers — to Angela Scaramucci and her Career Prep class. She let us know about internship opportunities with the Penguins and Steelers and then put in good recommendations for me for both. Angela also helped me land an upcoming summer internship in marketing with Schneider Downs. I interviewed with them last week and was just offered the position for the summer. 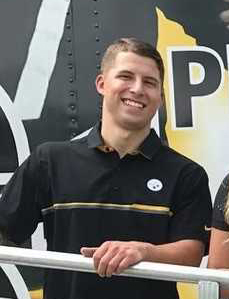 Tell us about your previous marketing internship with the Pittsburgh Steelers. Due to the number of hours I worked, I ended up earning six credits for this internship. I worked in the Steelers office twice a week and then did a lot of outside events such as youth football camps, a women’s training camp, a men’s Fantasy Football camp as well as the actual Steelers training camp at St. Vincent College. In this internship, I learned about the importance of relationships and having good people skills. I worked with a lot of different personalities and moving parts. Also, working at the events taught me to always be prepared and expect the unexpected. How have your SAEM classes helped you in these internships? My SAEM classes have given me insight into what to expect working in the real world. The classes are very hands on and the professors know the industries because they have worked in them. I really liked Professor David Rowell’s Intro to SAEM class, Professor Paige Beal’s Marketing and Promotion class and Personal Branding and Development with Professor Bob Derda. Also, a lot of my classes have featured guest speakers who are working in the industry, which I find interesting and helpful. The classes are setting a good foundation and preparing me as best as possible for the real world. Ideally, I’d like to work in a marketing or media role with a professional sports team in hockey, football or basketball. I’m also interested in collegiate sports. The University has exceeded my expectations and all of the professors are really great. My advice to students is to be open to any and everything. Don’t be afraid to put yourself out there. It can really help you both personally and professionally.